In the UK? Call NHS Choices on 111 and consider the ideas below. It will be Self-Injury Awareness Day (SIAD) on the 1st of March. Check our SIAD page for downloads and details. Trigger warning: This page deals with caring for wounds, and therefore uses medical words that might upset some people. When you need to SI please find a safe place where you will not be disturbed and that you feel calm in, always use new blades where you can and have your first aid kit ready to hand. LifeSIGNS does not encourage the use of self injury, we simply accept that self injury is a coping method for some people at this time, and we do encourage people who are determined to self injure to do it in as safe and controlled way as possible to minimise harm. If the area of injury is on a limb then raise the limb to reduce blood flow to the area, reducing blood loss and allowing time for a blood clot to form. Not for emergencies, but follow us for helpful ideas. Not for support, but for recovery and news. Follow LifeSIGNS for ideas and memes. Join LifeSIGNS – subscribe to our irregular newsletter. If your method of SI is burning by scalding or using a heated object then the most important thing you can do is lower the temperature of the affected area. The tissue damage that has been caused can progress very rapidly so you must rinse the area under cold running water for at least 10 minutes. If there is any clothing surrounding the burn please remove this by either taking it off or cutting it away; this also applies to removing constricting objects such as rings, watches, bracelets; just take it off. This is done because once tissue has been burned or damaged swelling of the area will follow; also the tissue can become sticky and attach to clothes or other things. IMPORTANT If there is anything that is already stuck to the burn, DO NOT remove it, this could make the situation worse. 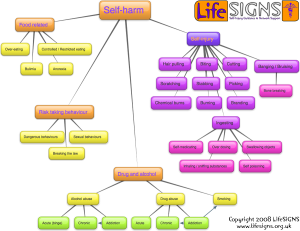 Self-harm is an umbrella term, that includes self-injury. If you have taken an overdose or have ingested toxic substances, then medical attention must be sought immediately. Sometimes the effects can be delayed, so even if you feel fine at the moment you might not be. Never induce vomiting. When you go to A&E take along with you the packaging from the medication or substance which you have taken. Not seeking help can result in long-term irreversible damage or death, even if this was not what you intended to occur, so it is very important. Is the idea of deliberatly hurting yourself baffling to you? Self-injury can provide temporary release from overwhelming emotional distress. It is very important that you tell someone if you have hurt yourself severely or if you have taken an overdose / swallowed chemical substances. It is normal to be scared, but it is essential to get proper medical attention as quickly as possible. The following bullet points give some situations where medical attention should be sought, however it is not exhaustive. If you are ever in doubt, phone NHS Direct on 0845 4647 or contact your GP, and they will give advice. NHS Direct will provide you with a trained nurse to talk to almost immediately. If after a few hours or several days you can see the wound is infected; it could be red, sore, swollen or weeping. Talk to NHS Choices now on (111) – call them from the UK simply by dialing 111. Need to talk now? See the available Helplines. There may come a time when you want to get real-life help and support for your self-injury. You may not want to talk to your doctor about self-injury, and you don’t have to! You can ask to speak to a counsellor. First Aid from NHS Choices. You may want to think about reducing the noticeability of your scars, or even camouflaging them. Monica, have you found that self-injury has helped you cope with overwhelming emotions, or some difficult things at home or school? Aren’t you now worried that self-injury has taken over your life? It sounds like you’re in deep, and it’s highly likely that an adult is going to want to talk to you about what’s going on in your life. Why not choose to talk to someone asap rather than waiting for someone to surprise you? Of couse, I understand that whatever has driven you to self-injure is hard to talk about, but you need and deserve support, and so it’s time you confided in someone and got help with the underlying problem – so you can then reduce your reliance upon self-injury. You need to get help. You can’t continue like this. You’re alone in your distress, and alone in your self-care – you need and deserve help and support. It’s time to talk to your parents about the things behind your self-injury.